Orono's Lauren Stoops (center) finishes first in the 100-meter dash with a time of 12.88 seconds during the Class C state track and field championships Saturday at Foxcroft Academy. Stoops also won the 200 and finished third in the 400 to help Orono capture the state title. 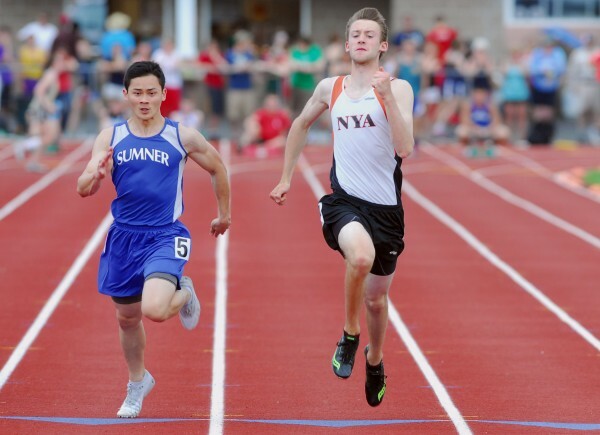 North Yarmouth Academy's Michael McIntosh (right)finishes first in the 100-meter dash with a time of 11.39 seconds just ahead of Sumner'as Baramee Janla's 11.43 during the Class C state track and field championships Saturday at Foxcroft Academy. 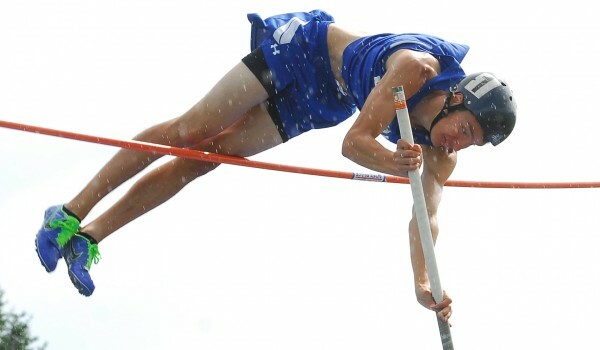 Madison's Ron Helderman wins the pole vault, clearing 13 feet, 3 inches at the Class C state track and field championships Saturday in Dover-Foxcroft. He attempted to set a new state record, but came up just short trying to clear 13 feet, 10 inches. 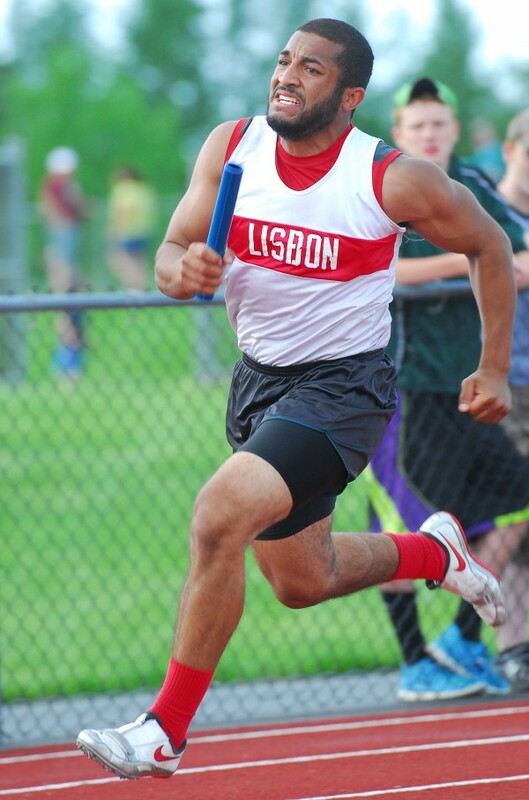 Lisbon's Quincy Thompson competes in a relay at the Class C State Track and Field Championship meet at Foxcroft Academy Saturday. Chase Collier of Lisbon clears the final hurdle for second place during the 300 meter hurdles at the Class C State Track and Field Championship meet at Foxcroft Academy Saturday. 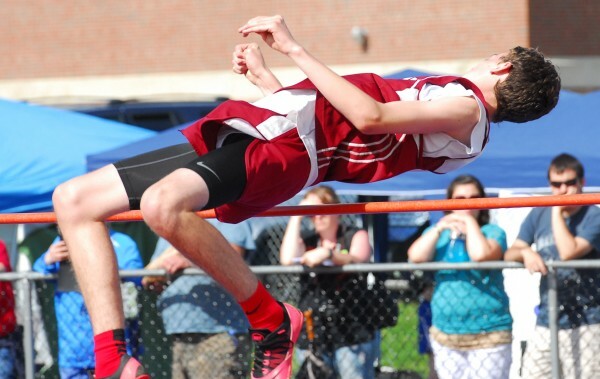 Orono's Jacob Fandel clears 5 feet, 4 inches in the high jump at the Class C state track and field championships Saturday at Foxcroft Academy. DOVER-FOXCROFT, Maine — Graduation was nearly a week removed, but for Orono seniors like Sherraiah Grace and Libby Spencer one rite of their high school experience remained unfinished. Fulfillment came Saturday at Oakes Field when they helped the Red Riots’ girls outdoor track and field team win its third consecutive Class C state championship. Coach Chris Libby’s Orono girls squad amassed 102 points to outdistance second-place Traip Academy of Kittery (74). Seacoast Christian of South Berwick was next with 43 points, with Maranacook of Readfield (31⅓) fourth and Yarmouth, Catherine McAuley of Portland and Saint Dominic of Auburn all tied for fifth with 28 points. Lisbon, a team that practices on a dirt track but is awaiting a municipal vote Tuesday that could approve construction of an all-weather facility for the sport, emerged from a tight competition to win its first boys title. The nine-time reigning Mountain Valley Conference champions led Orono by just two points entering the final event but used a third-place finish in the 1,600-meter relay to finish with 67 points, six ahead of the runner-up Red Riots. North Yarmouth Academy (60), Maranacook (58) and Sacopee Valley of South Hiram (55) were next. “Our coaches are wicked hard-working coaches,” said Lisbon senior race walker Tyler Bard. “To do this for them, to do this for [36th-year head coach Dean] Hall after all these years, it’s amazing to know that our team finally broke the streak. 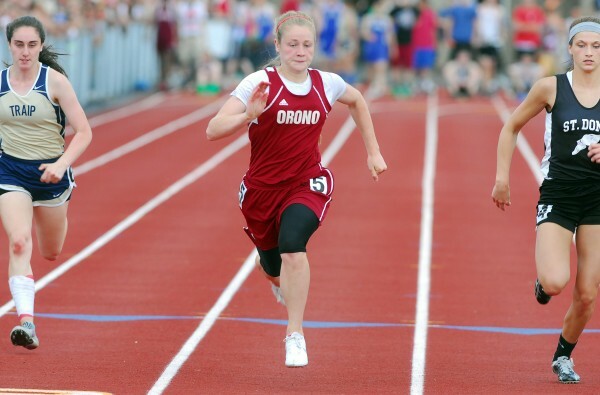 The Orono girls were without junior sprinter Diana Tyutyunnyk, who was unable to attend, but sophomore Lauren Stoops won both the 100- and 200-meter dashes to pace the Red Riots. Orono’s 1,600-meter relay tandem of Grace and freshmen Kassidy Dill, Hannah Steelman and Becky Lopez-Anido and its 3,200-meter relay team of Dill, Steelman, Lopez-Andido and junior Lily Koffman also were victorious, while Lopez-Anido and Stoops finished 2-3 in the 400 and Lopez-Anido also placed second in the 800. The Red Riots also got 2-3 finishes from sophomores Allison Pickering and Samantha Round in the pole vault, thirds from senior Elea Kass in the javelin and Grace in the 300 hurdles and two fourths from Koffman 1,600 and 3,200. Stoops was one of three double-event winners in the girls meet, along with Olivia Smith of McAuley in the javelin and discus and Mattanawcook Academy of Lincoln freshman Tia Tardy, who won the long jump and then nipped Lopez-Anido at the finish line of the 800 in a personal-best time of 2:24.12. “Becky gave me a really good go and that definitely helped,” said Tardy. Carsyn Koch of Washburn broke an 18-year-old Class C state record in the high jump with a best of 5 feet, 5½ inches, one-half inch better than the 5-5 turned in by Hebron Academy’s Meg Muller in 1996. That was one of two state records set during the meet, the second when Michael McIntosh of NYA edged Baramee Janla of Sumner of East Sullivan to win the boys 100 dash in 11.39 seconds. Janla was second in 11.43, which equaled the previous record set last year by Tyler Fitzgerald of Hall-Dale of Farmingdale. Lisbon scored its only individual-event victory in the 1,600 race walk where Bard and Jeff Willey finished first and second. Orono had two event victories, from Brandon Crocker in the 300 hurdles and from its 3,200-meter relay team of Edin Dulin, James O’Neil, Conall Molloy and Tristan Butterfield. Eric Hathaway of Maine Central Institute of Pittsfield (javelin and discus), Ron Helderman of Madison (110 hurdles and pole vault), Josef Holt-Andrews of Telstar of Bethel (1,600 and 3,200 runs) and Marques Houston of Monmouth Academy (200 and 400) were double-event winners in the boys meet. Other boys event champions were Judson Smith of host Foxcroft Academy in the high jump, Kelby Mace of Maranacook (long jump), Ryan Moulton of Sacopee Valley (triple jump), Darren Shi of Yarmouth (shot put), Isaac LaCroix of Seacoast Christian (800), the NYA 400 relay team and the Monmouth Academy 1,600 relay squad. 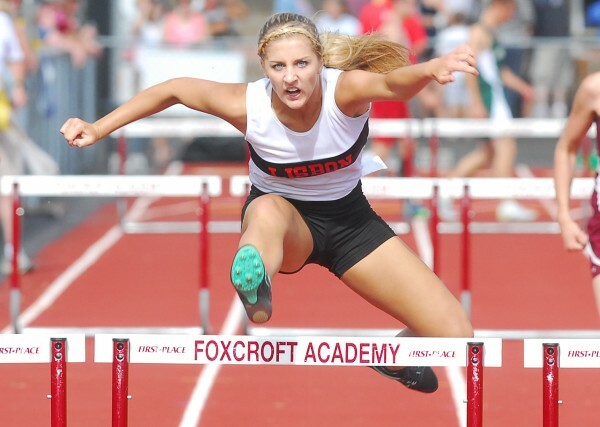 Other girls champions were Ashleigh Roberts of Traip (100 hurdles), Sydney Sirois of Saint Dominic (1,600 race walk), Laken Carrigan of Seacoast Christian (1,600), Kylene DeSmith of Seacoast Christian (triple jump), Elora McCuddy of Traip (400), Leila Alfaro of Kents Hill (300 hurdles), Anne McKee of Kents Hill (3,200), Emma Pluntke of Carrabec of North Anson (shot put), Jolene Potter of Maranacook (pole vault), and the Washburn 400 relay team of Carsyn Koch, Tori Koch, Joan Overman and Tyra Shaw. Both the Orono boys and girls teams were awarded the Eastern Maine Class C sportsmanship awards, while the Lisbon boys and Telstar of Bethel girls were Western C recipients.